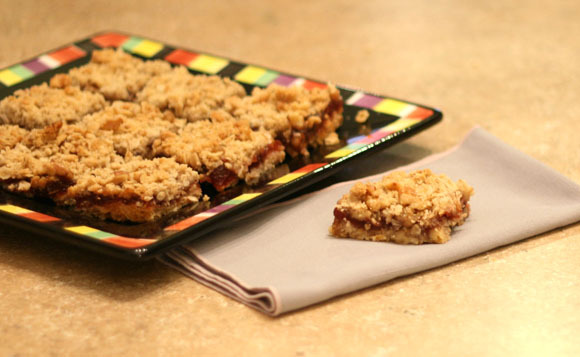 Cranberry Nut Streusel Bars are great for a brunch or even Christmas morning! Preheat oven to 350°F and lightly grease a 9 inch square or round baking pan. Stir together cranberry sauce and sugar in a small bowl. Microwave for 1 minute and stir. Keep heating for 30 seconds at a time until the sugar is dissolved. Mix flour, oats, brown sugar and salt together in a large bowl. Cut butter into small pieces and work it into the flour mixture with your fingers until crumbly. Stir in walnuts. Press 2 cups of the crumbly streusel into the prepared pan. Spread on the cranberry sauce mixture and sprinkle on the remaining streusel. Bake until light brown on top, about 30 minutes.